Infiltration of Scilab and Liberation Mission 1! Oran Isle and Liberaton Mission 2! Cloud Cover and Liberation Mission 3! Queen Bohemia and Liberation Mission 4! Enter Gargoyle Castle and Liberation Mission 5! The Undernet, signs of courage, and Liberation Mission 6! Nebula attacks Electopia, and the return of a teammate! Nebula Grey, Soulnet and the Final Battle! Enter into Murkland and Liberation Mission 7! Murkland outskirts and Liberation Mission 8! Murkland depths and Liberation Mission 9! Murkland core and darkness team fight! Mega Man Battle Network 5 is the fifth and penultimate installment of the Battle Network series. 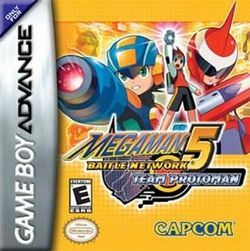 This game has three versions: Mega Man Battle Network 5: Team ProtoMan and Mega Man Battle Network 5: Team Colonel, both for the Game Boy Advance, which have similar gameplay but slightly different supporting characters and stories, and Mega Man Battle Network 5: Double Team DS, which includes the content from both games. The Japanese versions are titled Rockman EXE 5: Team of Blues, Rockman EXE 5: Team of Colonel, and Rockman EXE 5 DS: Twin Leaders. This page was last edited on 10 March 2015, at 17:21. This page has been accessed 18,364 times.